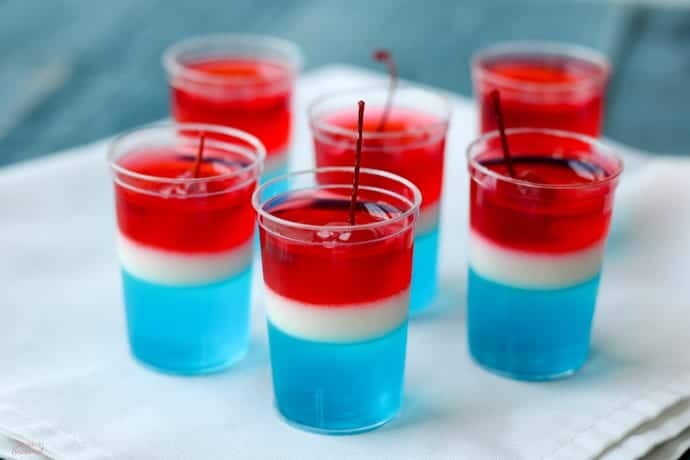 Perfect for 4th of July or Memorial Day celebrations, these Firecracker Jello Cups are a delicious pop of color on the party table! It’s May. MAY, people! Memorial Day is this month! The school year is over in a matter of weeks! How is this even possible?!? I can’t be the only one who’s feeling this way. It was like January lasted for 3 months and then suddenly it’s time for summer. Honestly, I’m OK with it. 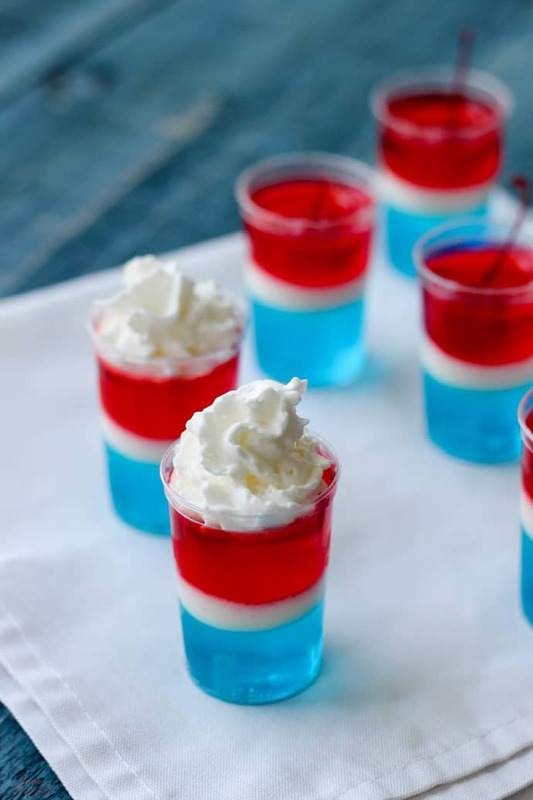 I’m ready for some freedom in our schedule, swimming, long summer nights and lots of red, white and blue like these cute Firecracker Jello Cups. I have been holding onto these summer treats since last July. 🙂 I made them for our family’s July 4th celebration, and I snapped a few quick pictures before we gobbled them up. But after Independence Day, there’s not much of a need for red, white and blue desserts, so I put them away in a file and waited patiently for 2018 to roll around. 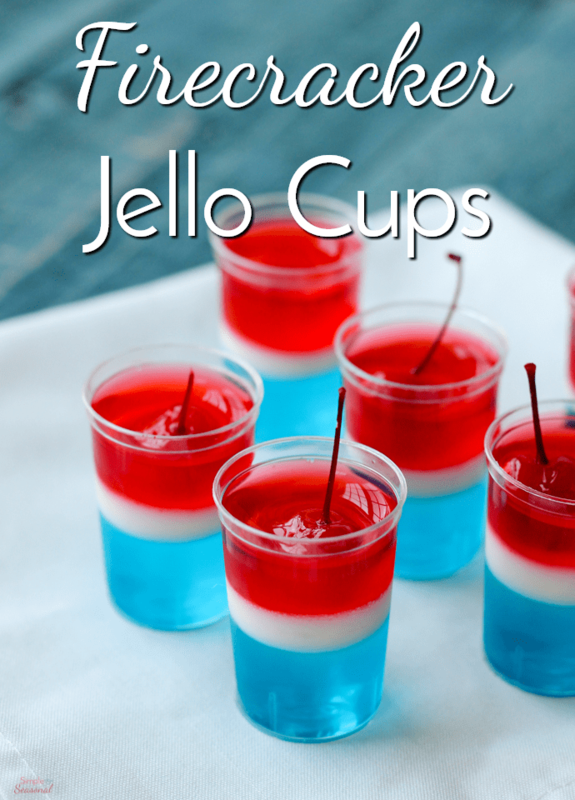 Now here we are, and I finally get to share the easy recipe for Firecracker Jello Cups! 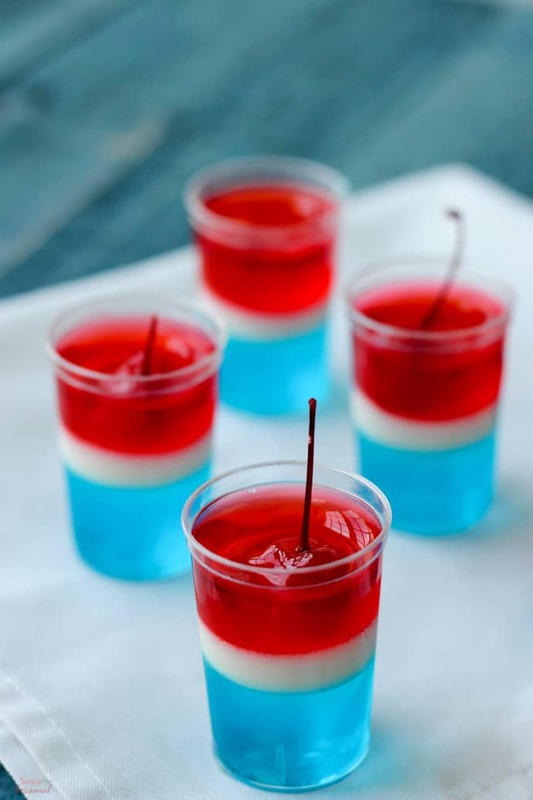 These cute summer desserts get their name from their cylindrical shape (like the TNT you’d always see on old Bugs Bunny cartoons) and the “fuse” sticking out the top. I will be totally honest-the cherries are a HUGE pain. It’s hard to get them to stay upright. But they don’t exactly look like fire crackers without them! 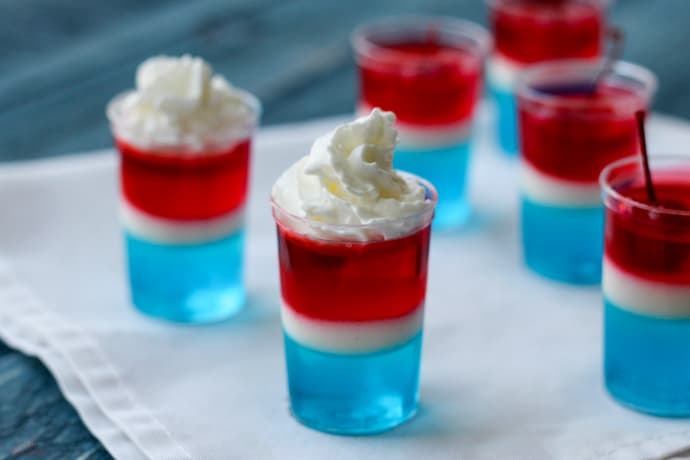 If you’re thinking of doing this for a Memorial Day picnic, you could totally get away with leaving the cherry off and just topping them with whipped cream. July 4th is all about fireworks, though, so if you’re going to do it, then go all the way! 🙂 Whatever you do, don’t skip the creamy white layer in the middle-it’s the best part! Follow the box instructions for making the blue Jello (2 cups boiling water, dissolve the gelatin, then add 2 cups cold water.) Fill shot glasses (2 oz plastic cups) 1/3 of the way. Refrigerate for 60-90 minutes. Combine 2 envelopes of unflavored gelatin and 1 1/2 cups of hot water. Stir to dissolve completely. Mix in sweetened condensed milk. Spoon into glasses until 2/3 full. Return to refrigerator for another 60-90 minutes. Follow the box instructions for making the red Jello. 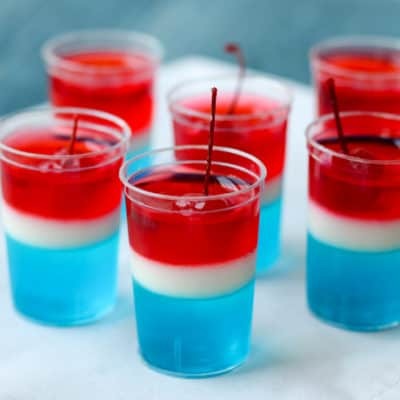 Place a cherry on top of the white layer, then fill glasses the rest of the way with the red Jello. Return to refrigerator. Check in 10 minutes and adjust the cherry stems so they are standing upright. Leave in the refrigerator for another 60-90 minutes or until set completely. Keep refrigerated until ready to serve. Top with whipped cream if you prefer! Aren’t they such a great pop of color? They look so pretty on a tray or at each place at the table. Just remember to give yourself enough time to allow each layer to set. 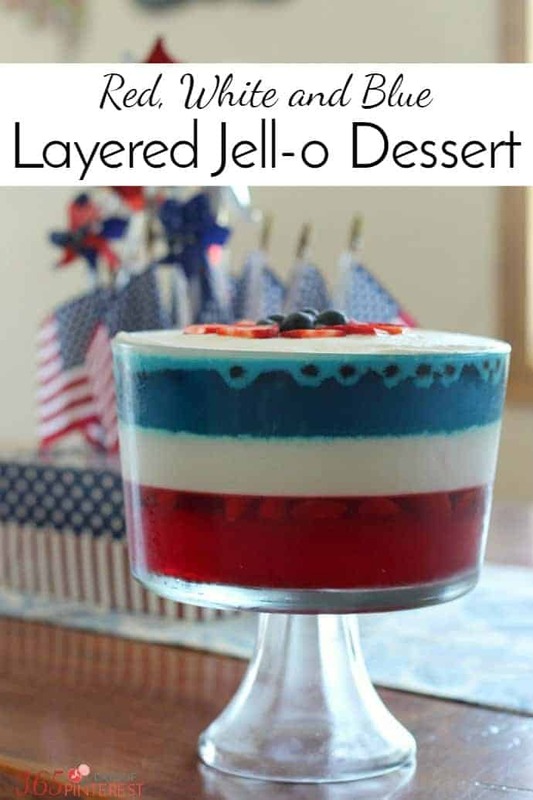 If you like the idea of layers like Firecracker Jello Cups but don’t really want to hassle with the cups, try this Layered Red, White and Blue Jello Dessert! It’s filled with fruit and the middle layer is rich and creamy-the recipe is different but it’s the same look!